MOSCOW, August 24. /TASS/. 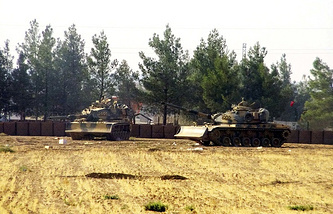 The operation just launched by Turkey’s armed forces in the border town of Jarablus in Syria, officially targeting the terrorist organization calling itself the Islamic State, is in reality aimed at Syria’s Kurds, analysts interviewed by TASS stated. Turkey’s news agency, Anadolu, announced that the Turkish army on Wednesday initiated an operation to liberate the IS-held city of Jarablus, in northern Syria. 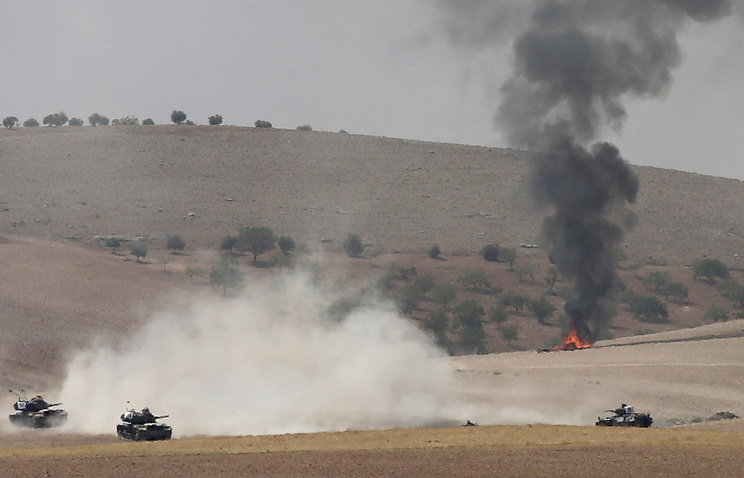 According to the television channel Haberturk, Turkish artillery and aircraft have already wiped out more than 80 targets, thereby providing support for the Syrian forces confronting the Islamic State. "An upsurge in activity by Syrian Kurdish armed units was what chiefly triggered Turkey to launch Euphrates Shield," says Assistant Professor Vyacheslav Shlykov at the Institute of Asia and Africa Studies. Several days ago, the Syrian Democratic Forces, in which Kurdish armed groups play a major role, mounted an offensive towards Jarablus. Should the Syrian Kurds manage to clear the city of Islamic State militants, Shlykov believes, they will be able to easily move on and gain control of a significant section of the Turkish-Syrian border. "The Turkish army’s ground offensive is a forestalling operation, expected to outpace the advancing Syrian Kurds," he said. "The Kurds’ aim is to create an autonomy in the territory of Syria. For Ankara such a development would be extremely undesirable, to say the least, because the Syrian Kurds are tied to the Kurdistan Workers’ Party, which Turkey views as a terrorist organization. It is no accident that Turkish officials have proclaimed the purpose of the offensive on Jarablus to be not only a struggle with the Islamic State, but also a crackdown on all other organizations, including Syrian Kurdish forces, which Turkey regards as terrorists," Shlykov emphasized. Yevgeny Satanovsky, President of the Middle East Institute agrees. The way he sees it, Ankara’s number one problem is not the Islamic State but the hypothetical risk that a Syrian Kurdistan may materialize. "According to the information available, the Islamic State terrorists’ positions lie some 20 kilometers away from Jarablus, while the Turkish army has so far confined itself to attacking Kurdish forces," Satanovsky points out. The Deputy Director of the Military and Political Studies Institute, Aleksandr Khramchikhin, believes that the real purpose behind the Turkish military’s operation near Jarablus is to furnish support for the so-called moderate Syrian opposition and to prevent the armed formations of Syrian Kurds from retaking this city and its environs from the terrorists. "Upsetting the Syrian Kurds’ attempts to establish control of Jarablus is the main purpose of the recently-launched ground operation by Turkey’s armed forces. To camouflage its real intention, Ankara pretends to have begun an offensive against the terrorist Islamic State that it had supported for so long," Khramchikhin stressed. Analysts recall that the United States provides active support for Syrian Kurdish armed groups who are effectively fighting against Islamic State militants. The Kurdish issue will be high on the agenda of US Vice-President Joe Biden’s visit to Turkey, which began on Wednesday. "Turkey began the Euphrates Shield operation not because it wants to annoy Washington, but because it pursues its own vital interest - that of preventing the Syrian Kurds from pooling together the territories they populate. Such a development would endanger Turkey’s national interests. In that sense, Ankara would not care what Washington may think. The stakes are too high," says Satanovsky. He believes that Syria’s President Bashar Assad is not interested in Syria’s federalization, as well. "One can even imagine the possibility Ankara and Damascus entering into negotiations to prevent Syrian Kurdish autonomy from ever taking shape," he remarks. Turkey formally notified Russia that it had begun Euphrates Shield. "I don’t think that Russia directly supported the operation, but the offensive was certainly coordinated with it, because Turkish aircraft are involved in the offensive," Khramchikhin explained. Assistant professor Vyacheslav Shlykov, whose dissertation was devoted to the 1971 government coup in Turkey, believes that the July coup and the ensuing purges in the Turkish military have by no means upset its combat readiness. "Although the commissioned officer corps has suffered considerable losses after the suppression of the July 15 armed coup, the Turkish army’s combat potential remains the highest in the entire Middle East. And inside NATO, its level of training is higher than that of any other army," Shlykov emphasized. Among other things Ankara’s latest-launched thrust towards Jarablus is the Turkish army’s way of demonstrating to the world that it is strong enough to repel any threat to national security.